Get Hololens Technology on Your Job Site Today! We get it. Construction technology is evolving faster than your company can keep pace with. The latest in that technology are mixed-reality solutions. Mixed Reality technology blends real-world objects with digital content, interactively, and in real-time. Together with holographic technology, it brings the models out of the screen and helps people efficiently interpret physical and digital information, and the spatial relations between them. The leader in Mixed Reality is Trimble Connect for Hololens. 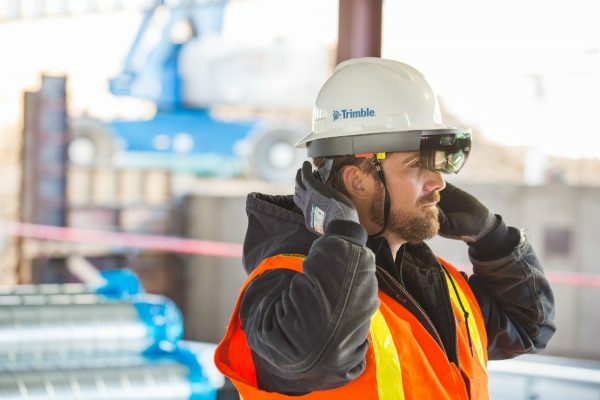 Built on the cloud-hosted Trimble Connect collaboration platform, Trimble Connect for HoloLens supports a new way of working with AECO models throughout the building lifecycle, providing every stakeholder with the latest data on their site, literally. Increase confidence and reduce rework by effectively conveying and clarifying design intent and impact to all stakeholders. Maximize your BIM investment to track progress, quickly identify discrepancies, and assure quality by overlaying models on the real world. Optimize and expedite coordination with stacked 3D data from multiple trades, both digital and physical. Accelerate decision making and reduce downtime by enhancing communication and collaboration between local and remote teams.